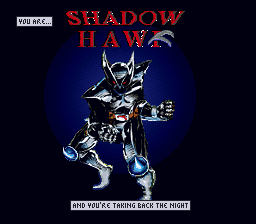 Shadowhawk is an action/platform game that was based on the comic of the same name. It was unreleased, due to a lack of publisher. Shadowhawk is a comic by Image Comics (or rather their sister studio, Shadowline), a studio set up by people who worked for places like Marvel, but wanted to retain copyright of their creations. Jim Valentino was one of those people, and he created Shadowhawk, an anti-hero who went on a vendetta after getting attacked and infected with HIV. This comic came out during the explosion of the medium in the early 90s, and I have to admit that I was not into it at all. 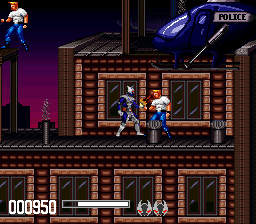 Valentino, seeing the success of the 16-bit era consoles and a crossover with Shadowhawk's main audience, apparently decided to finance the creation of a video game. However, it never saw the light of day, much like other games based on lesser known comics, such as Prime and Firearm. So how did this game come to be known? Read on. 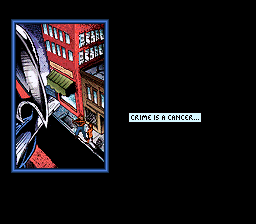 ShadowHawk was based on the Image Comics' spine-breaking vigilante anti-hero of the same name. The main part of each level was to be a 2D side-scrolling platform-jumping, where you would utilize your throwing-star type weapons to attack, your grappling hook to climb, and a special move where you could jump over your enemies and bust their spines, if you were quick enough when their backs were turned. 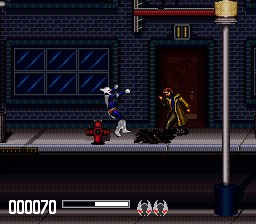 At the end of each level, you would confront a boss character (all villains from the comic) and watch the gameplay transform into a 2D Street Fighter-style fighting game. The game was created during the final days of the SNES and Studio e couldn't find a publisher for the title. It was all but finished when plans for it were dropped. In January 2003, a poster on the Digital Press forums by the name "jimmyfranks" posted a thread stating that he had a prototype of the game and was looking to sell it. This thread also reminds me how much of a backlog I have, as I mentioned I would make an article on it, and it took over 13 years! He eventually posted a thread in March 2003, selling it to prototype collector "Buyatari". 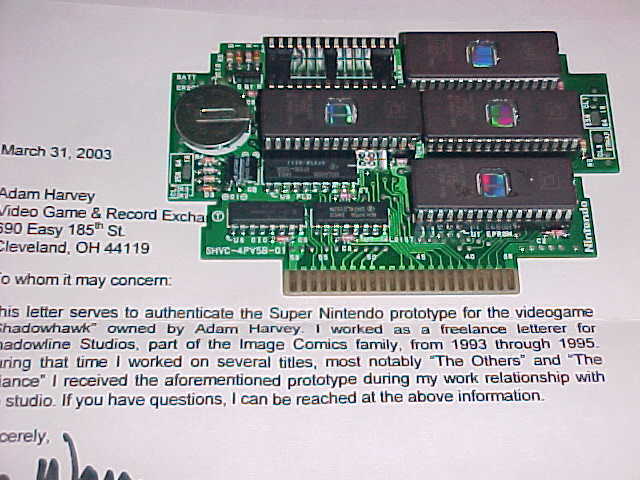 Letter that came with the prototype. It is addressed to Buyatari (Adam Harvey). The prototype was originally owned by "jimmyfranks", who got it while he worked for Shadowline studio, a partner studio of Image Comics that was founded by Shadowhawk author Jim Valentino. The date on the letter indicates that this was from the original sale on Digital Press. Thanks Buyatari. That sounds like a good idea-I'd like to make sure it gets ripped to ROM though (provided I don't have a useless piece of plastic on my hands)-I'd like to make that a condition upon sale. Although there's no way to make sure anyone would honor it, I'd think that the spirit of this page is to make stuff like this available. I'll have some pics posted by next week. Alas, the game was not dumped until buyatari sold it to someone else. Buyatari attempted to sell the prototype as early as 2007. The picture above is from that sales thread. As of 2009, he still was trying to sell it. He tried selling it again in 2010 on Nintendo Age. I found another thread where he is discussing the feasibility of doing a bootleg run, and mentions his prototype does not have sound. In a sales thread on Nintendo Age in 2011, it was marked as sold. According to the feedback, it was sold to forum user "gwyndion" for $755. Eventually, the prototype (or at least the binary) fell in the hands of bootleg maker, Rose Colored Gaming. I assume that the source is from the "jimmyfranks" prototype, but I am not 100% certain. 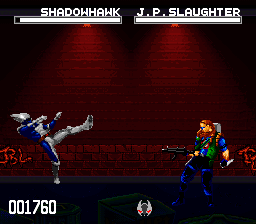 They did a run of 100 copies of a bootleg of Shadowhawk, but Jim Valentino threatened them with legal action. According to this thread, they assumed that Jim Valentino had signed off on it, but it turned out not to be the case. 36 of the bootlegs were sold before this happened. 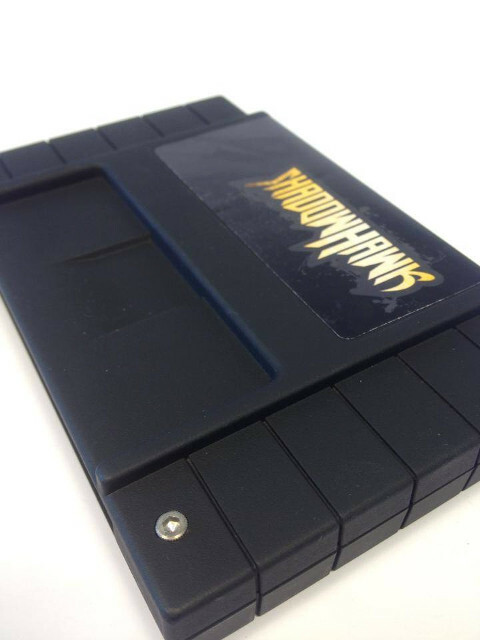 Picture of the bootleg that was available on Rose Colored Gaming's Facebook page. With 36 bootlegs out there, it was only a matter of time before the ROM image would be dumped and find its way onto the Internet. 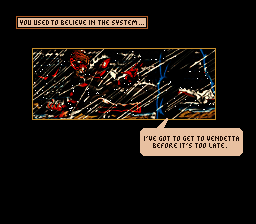 As you can see above, the graphic imagery of the comic remains intact in the prototype of the game. 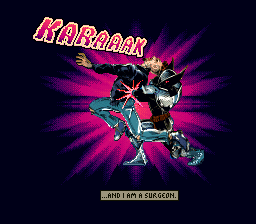 I highly doubt that Nintendo would have allowed an explicit picture of Shadowhawk breaking a guy's back, at least not without an ESRB "M" rating. The rest of the game is tame enough that it probably would have got the K-A rating. The game is split into two modes. 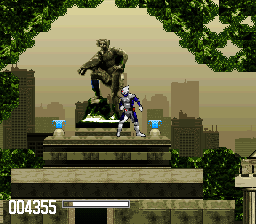 It featured one or two platforming stages, followed by a Mortal Kombat-style boss fight. After beating each level, you get a cut scene with the story, and usually a hint at who the next boss is. The most annoying aspect of the controls is that they have mapped the Y button as jump, so that took a bit of getting used to. 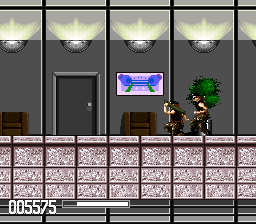 The jump controls are pretty floaty, and it is hard to get off a jump attack against the enemies. One interesting thing they have done in this game is to ignore the standard video game trope of the enemies not taking damage when they hit you - in the first few levels you can easily cruise beat most of the enemies just by walking through them. This serves you well, because the punch and kick attacks have a very short range, less than most of the enemies in the game. You can throw a boomerang, but I found that most enemies with shooting attacks will hit you before you even get a chance to throw it. A neat aspect is the grappling hook, which can allow you to quickly swing through a level. The boss fights are an almost exact Mortal Kombat clone. 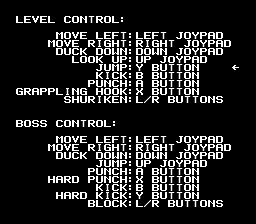 The controls are set up the same (high and low punches and kicks on the face, block with the shoulder buttons). I wasn't able to consistently do special moves, but they appear to be standard fighting game motions. After beating the boss, they stand there dizzy, which may mean you can pull off a fatality style move. Without a move guide, there is no way I can figure out if that is true. I don't think that it would have been deep enough to be a stand-alone game, though I can envision the boss fights being a two-player mode in the completed game. No way you can get past these guys without getting hit Glitches happening here. Although this game is apparently playable to the end (I did not have the patience to get that far), it is very clear this prototype is not a completed game. 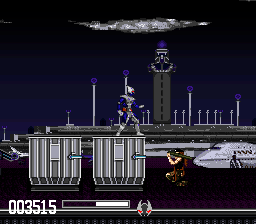 This become evident in the fourth stage (Boldd Tower), where there are graphical glitches, plenty of obscuring foreground barriers, and non-obvious places where you are supposed to crouch and go down. 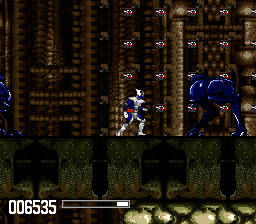 The enemies in this stage are also relentless. It is pretty much impossible to get past the bazooka guys without getting hit, and you often encounter two or three of them at a time. I still got pretty far into this level, because the game is very generous with the health bar and there are powerups throughout the level, but I couldn't quite get to the end. The music in the game is very driving hard rock, and may be the best aspect of the prototype. But here's the thing, as mentioned above, Buyatari stated that the prototype did not have sound. This leads to three possibilities: (1) Buyatari remembered incorrectly, (2) The ROM image used in the bootleg comes from a different, more complete version of the game and not the "jimmyfranks" prototype, or (3) the prototype had sound disabled, and the bootleg maker hacked it so that it worked. In addition, the internal header of the game has all the proper information that you would see in the final game, including a correct checksum. It is unlikely that an in-development game would have a properly formatted header, especially when this was not a read-for-submission prototype (it lacks "Licensed by Nintendo" in the title splash screen, which would instantly cause a rejection). So we should keep in mind that this may be an altered version of the game. Even so, considering the lack of polish, I doubt that any hack was extensive, and the screens match up with the Videogames.com article on the game. A few hours after posting this article, I was sent another ROM image of Shadowhawk by Frank Cifaldi. My initial suspicions that the ROM image I originally got was hacked turned out to be completely justified. The hacked ROM had 262 bytes changed for the bootleg release. Aside from fixing the internal header, they made a change to the way that your character reacts to running into enemies or environment hazards that can harm you. Rather than the enemy taking damage when you run into them, the unhacked version has this awkward recoil motion (see image below). This makes it incredibly hard to attack enemies, especially if there are more than one of them near you. I also think the amount of damage you take was reduced in the hack. Another thing I found out was that if you press select at the title screen, you can edit the controls. So no more "Y is jump" nonsense if you don't like that. Kung Fu Furby, a follower I have on Twitter, found out why Buyatari had problems with the sound. The sound is only coming through the left channel, so this is a completely mono game. If Buyatari only hooked up the right channel to his TV, he would have gotten the impression that there was no sound. The hacked version does not fix this.